The ultimate collectible for Ghostbusters fans! Molded and cast from the original hero prop. Every detail, warp, dent, scratch, and crack is painstakingly recreated. Working toggle switches and buttons on the wand trigger the electronic sequence! Designed in 1984 by Egon Spengler and Ray Stantz, the nuclear-powered proton pack counters the negative energy of ghosts with a proton stream of positively charged ions. Cast from an original hero prop, Anovos presents the ultimate collectible for Ghostbusters fans - the Ghostbusters Spengler Legacy Proton Pack Prop Replica! Molded and cast from the original Dr. Spengler hero proton pack (named this because of the "Spengler" annotation written on the back of the piece) using only the best molding techniques and the finest of platinum silicones to minimize mold shrinkage, Anovos employed techniques to painstakingly capture every detail, warp, and crack. Upon completion of the molding process and returning the original pack to the Archives, the team took to the careful process of recreating the "master" paint sample. Matching the actual pack, the movie replica recreates the same textures and weathered appearance, dent for dent and scratch for scratch, befitting the legacy replica standard. This replica is a fine art collectible meant for adults only. - Constructed from a fiberglass shell against a metal backplate. - Accurate sourcing of the valves where possible. - The Neutrino Wand is a combination of fiberglass, resin, and acrylic. - The bumper and ion arm are constructed from high-impact resin with metal detailing. - Valves and other select details feature metal construction. - Working toggle switches and buttons on the wand trigger the electronic sequence. 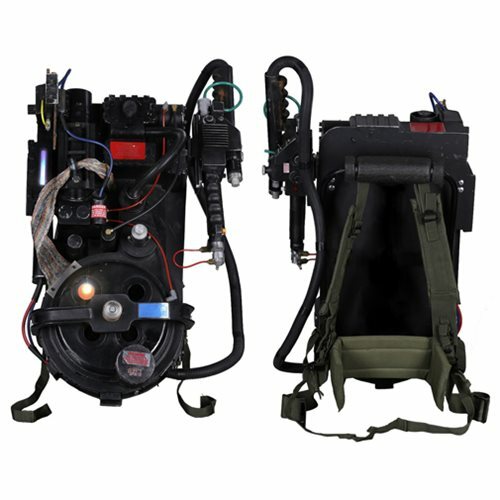 - Proton Pack frame is included. - Comes with display stand.